The Dark Tower is a 2017 American science fantasywestern film directed and co-written by Nikolaj Arcel. 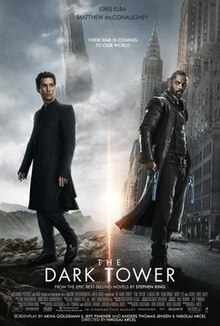 A continuation of Stephen King‘s novel series of the same name, the film stars Idris Elba as Roland Deschain, a gunslinger on a quest to protect the Dark Tower – a mythical structure which supports all realities – and Matthew McConaughey as his nemesis, Walter o’Dim, the Man in Black. Intended to launch a film and television franchise, the first installment combines elements from several novels in the eight-volume series, and takes place in both modern-day New York City and in Mid-World, Roland’s Old West-style parallel universe. The film also serves as a canonical sequel to the novel series, which concludes with the revelation that Roland’s quest is a cyclical time loop; the presence of the Horn of Eld, which Roland carries in the film, indicates that this is the next cycle. The Dark Tower premiered at the Museum of Modern Art in New York City on July 31, 2017, and was theatrically released in the United States on August 4, 2017 by Columbia Pictures. It has grossed $33 million worldwide against production budget of $60 million, and received generally negative reviews, with critics calling it “a dull disappointment without any set audience: incomprehensible to newbies, and wildly unfaithful and simplistic to fans of King’s books”, though Elba’s performance received some praise. Eleven-year-old Jake Chambers experiences visions involving a Man in Black who seeks to destroy a Tower and bring ruin to the world, and a Gunslinger who opposes him. Jake’s mother, stepfather, and psychiatrists dismiss these as dreams resulting from the trauma of his father’s death the previous year. At his apartment home in New York City, a group of workers from an alleged psychiatric facility offer to rehabilitate Jake; recognizing them from his visions as monsters wearing human skin, he flees. Jake tracks down an abandoned house from one of his visions, discovers a high-tech portal, and travels to a post-apocalyptic world called Mid-World. In Mid-World, Jake encounters the last Gunslinger, Roland Deschain who emerged in his visions. Roland is pursuing Walter Padick, the Man in Black who had also appeared in his dreams across a desert, seeking to kill him in revenge for the murder of his father, Steven. He explains that Walter has been abducting psychic children, and is attempting to use their powers to destroy the Dark Tower, a fabled structure located at the center of the universe; this will allow monsters from the darkness outside to invade and destroy reality. Roland takes Jake to a village to have his visions interpreted by a seer. Learning of Jake’s escape and journey to Mid-World, Walter investigates, and realizes that Jake has enough psychic potential to destroy the Tower single-handedly. He kills Jake’s stepfather, then interrogates his mother about his visions and kills her. In Mid-World, the seer explains that Roland can find Walter’s base of operations in New York. Okay book fans, I get it. The movie is really nothing like the book. Hand(s) full of history and scenes were absent, and key injuries to Roland forgotten… But that said –and I liked the books a lot, and recommend them– making that slow, over worded, drag along series into a movie would have been an epic mistake. What we ended up with, is a pretty cool minimalistic version of the story that captures the spirit and highlights of the tale within the books. I found it quite entertaining, action packed, and well paced, with a pretty thrilling climax. Find The Dark Tower and see the new trailer here. This entry was posted on Friday, August 11th, 2017 at 4:10 am	and posted in Uncategorized. You can follow any responses to this entry through the RSS 2.0 feed.